In about half an hour, at 11 a.m., the Giants championship parade will wind through the Canyon of Heroes, celebrating the G-Men's second improbable championship in four years. It is the pinnacle of New York City sports achievement, and it's something anyone who's around for it will never forget. It's also a chance to revisit one of our favorite New York sports stories: The time Joe Whelan, random fella, infiltrated the Giants' championship celebration and was basically best friends with the Giants on the greatest of all days. After the ceremony, I had to try to sneak back in to the locker room. I then saw a couple people of the Mara family (there were so many of them) that must not have gone up to the luxury box and once again I just acted like I was a family member. Next thing I know, I make it through two more security checkpoints and I'm right back in the locker room. This is where it was awesome. All the players were just dancing around and having a good time. Many of them were cleaning out their lockers and throwing things away. This is where I took all the pictures with the players. I could care less if I got caught at this point. I was just a lucky Giant fan that happened to sneak his way into the press section, then on to the owners bus, onto the field and into the locker room, all while going unnoticed. We couldn't help but wonder whether Whelan was going to try again this year, at today's parade, so we caught up with him yesterday to see if he had another run in him. And if not, if he had any advice for anybody who dared give a shot this year. So, are you going to try to sneak in this year? If so, do you think you'll have any luck? I plan to head down to the parade again this year. I'm not too confident in being able to "sneak" my way into any of the festivities, but I guess you never know. When I did it after Super Bowl XLII, I think I had the element of surprise working for me. Nobody had expected it. Due to all of the media attention I received four years ago, I wouldn't be surprised if my face is plastered all over the place for all of the police officers and security personnel to keep an eye out for me. What advice would you give someone who wants to try it? My advice to anyone that wants to try to crash the parade this year would be to just act like you belong. The more you keep your head down and roll with the punches, the more people will assume you are supposed to be there. If you act like a fan, you will be treated like a fan and get thrown out right away. The key for me that day was that I never hesitated in any of my decisions. Whether it was meeting up with the Maras as they walked off the stage, to stepping on to the team buses, to walking around the locker room, or to going on the field with the players. I made a decision, and then I just had the confidence to go along with it. You also have to have a contingency plan. You have to be ready for someone to ask you who you are and what you are doing there. I didn't really have one last time, but luckily nobody ever questioned me. What's the best memory you have of sneaking in last time? My favorite memory of the actual day was being in the locker room with the players. It was so nice to see them relaxing and kicking back with their families and celebrating the championship. They were all taking pictures and asking one another for autographs, so when I was doing the same thing, nobody questioned me. I walked away with some amazing photos as well as a team-signed hat, Eli-signed Super Bowl ticket, Eli-signed jersey, and a Strahan-signed media pass. The best part of the entire experience, though, was the aftermath that unfolded over the next week or so. I had sent a mass e-mail out to friends and family that went viral, and next thing I knew I was on ESPN Radio with Stephen A. Smith, on SI.com, homepage of Deadspin, local television and papers and receiving phone calls from Letterman, Kimmel, etc. It was a whirlwind and I was just taking it all in. I became a little bit of a local celebrity, so it was a lot of fun. All told: Which Super Bowl victory did you enjoy more? 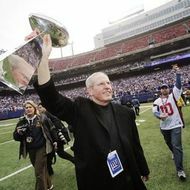 I must say I enjoyed Super Bowl XLII even more so than this year's. Unlike this year, I was able to go to the game in Arizona, so it took the experience to the next level. Nobody expected the Giants to win, so when they pulled off the upset, it was beyond my wildest dreams. I was also going through a very tough time personally. My 30-year-old sister had passed away in an accident four months earlier, so it was an uplift in life that I really needed at the time, and it made me really happy to bring joy to my family at a time when they didn't have any. I had a lot more confidence in the team coming into this year's game. They had been playing so well that I almost expected them to win.